Philippine President Rodrigo Duterte Has A New Adversary — The Church : Parallels The profanity-prone president and his country's Catholic Church are at loggerheads, mostly over Duterte's war on drugs, which has killed more than 7,500 people in less than a year. 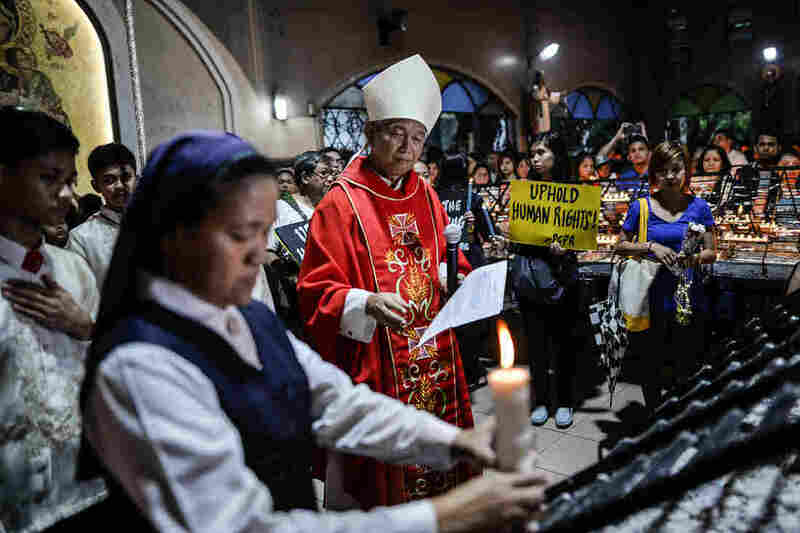 Philippine Catholic bishop Broderick Pabillo leads a vigil for victims of extrajudicial killings at a church in Manila in August 2016. The country's Catholic Bishops' Conference has issued a rare pastoral letter condemning President Rodrigo Duterte's bloody war on drugs, which has killed some 7,500 people since last June. It's 5 o'clock on a Sunday morning. The sun's not yet up, but the early mass at Santo Nino de Tondo Church is bursting with people, every pew packed, with hundreds more standing in the aisles as Auxiliary Bishop Broderick Pabillo delivers his sermon. 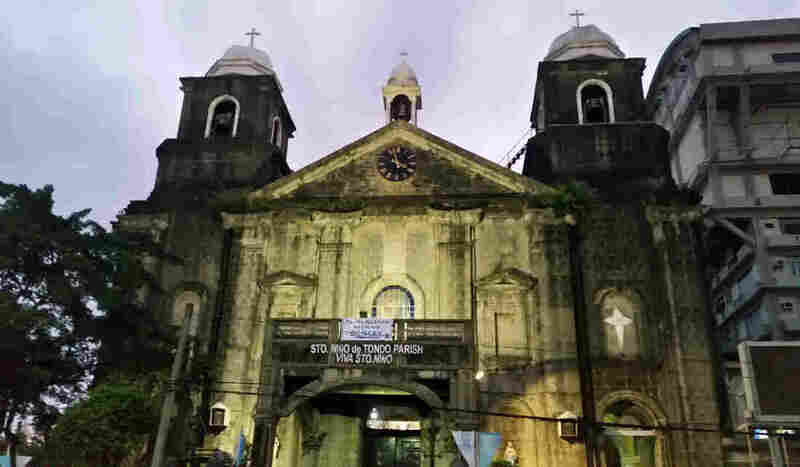 The church is in Tondo, one of Manila's most densely populated and poorest neighborhoods — one that has figured prominently in President Duterte's bloody war on drugs. That war has claimed more than 7,500 lives in the past eight months. And in February, it prompted the Catholic Bishops' Conference of the Philippines to issue a rare pastoral letter — read at churches like this one — condemning the death toll, calling the drug war a "reign of terror" aimed largely at the poor. It was a direct challenge to a president whose popularity remains high despite — or maybe because of — his war on drugs. "He's a danger. He's really causing a lot of harm to a lot of people," Pabillo says. "We are not declaring war on the war on drugs, we are declaring war on the killings, on the extrajudicial killings." The church has also come out strongly against another priority of the Duterte administration, the re-imposition of the death penalty. A version of the bill passed the Philippines House of Representatives last week and will now be considered by the Senate. "The culture of death is what we are fighting," Pabillo says. "The culture where the belief is that death is the solution to problems." In a country of more than 100 million people, more than 80 percent identify themselves as Catholic. And the church has traditionally wielded a great deal of political power, even though the Philippines is a secular state. The pastoral letter condemning the drug war, says sociologist of religion Jayeel Cornelio, "is an assertion of the public role of the Catholic Church in the Philippines as an institution that always informs policy." But there's a problem, says Cornelio, who directs the Development Studies Program at Ateneo de Manila University: People's perception of the church has changed. The church today is not the same powerful political actor that helped bring down Philippine dictator Ferdinand Marcos in 1986. Back then, Cardinal Jaime Sin, Manila's archbishop, was an instrumental figure in the "People Power" revolution that toppled Marcos. "So this is how things have already changed in the public sphere," Cornelio says. "It used to be that Cardinal Sin, whatever he said, was quite influential and people would listen to what he would say. Because at that time, Cardinal Sin was the antithesis to Ferdinand Marcos, the Catholic Church was the antithesis to the regime. "Now the Catholic Church is not seen as that. I think more and more people would like to see the church fulfill its spiritual mandate more than its political mandate." These days — in an increasingly secularized Philippines — Cornelio says polls show Philippine Catholics don't like it when priests use the pulpit for any political message. They're also increasingly intolerant of the church interfering in their private lives. The Philippines remains one of the few countries in the world where divorce is illegal. And access to family planning services remains contested, despite passage of a 2012 law meant to ensure availability of free contraceptives and prenatal care to all. Some local municipalities have dragged their feet in implementing the law; the church and other groups have gone to court to block parts of it as well. Duterte — who sees access to family planning as an anti-poverty measure — put another shot across the church's bow when he signed an executive order calling for the full and immediate implementation of the law, allowing millions of the poor access to free contraceptive and reproductive health services. "He's a person who has openly challenged the church in terms of interference in the affairs of the state," says political analyst Richard Heydarian. "The Catholic Church was trying its best to sabotage the government's effort to have a much more effective population management program. "Now Duterte comes in and essentially tells them to bug off, and he moves ahead with the reproductive health policy without any concern as for the backlash of the church." Duterte speaks far worse of the church's criticism of his war on drugs. In January, he accused the church of being "full of s***, corruption and all." He doubled down on his criticism of the church after the pastoral letter. Sociologist Jayeel Cornelio says it's not just an emotional response by the president. It's a calculated attack to "delegitimize" the church's role as a political player. "So," he says, "long story short, I think Duterte is simply, number one, capitalizing on public sentiment against the political involvement of the church. And two, it is a systematic attack on any critique or any criticism of this current administration." Several of Pabillo's parishioners seem unperturbed by Duterte's blunt language, having long ago grown accustomed to his style. And despite Pabillo's sermon, many say they agree with Duterte's war on drugs — even the extrajudicial killings. Pabillo concedes the church is facing an uphill battle. "But it's not a matter for us of winning or losing," he says. " It's a matter of right or wrong."